On the weekend of August 21st, I hosted a game jam. This came about following repeated discussions with a friend about RPG Maker, a game-making program. 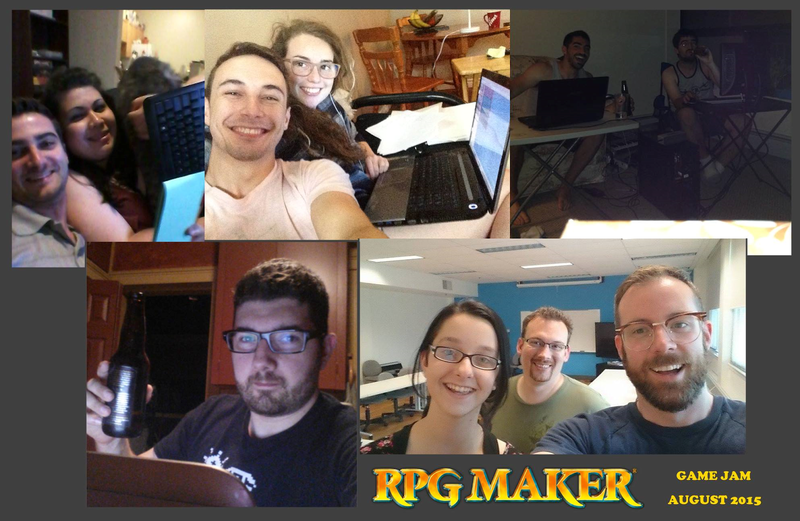 Basically, we were pumped to make RPG Maker games, and I thought it would be fun to get together with friends over the Internet to make games during the weekend. I was surprised and excited by the positive response to the idea. It was pretty short notice, though, and a few people were busy that weekend. But we still ended up with nine game submissions! Click on that last link to check out everyone's entries. The theme, announced at the start of the jam, was pride. Here are some of the participants having fun while making their games! The Fall of Grant Manor by Daniel Ouellet and Moni Lasangue is a choose-your-own-adventure horror game. Pride by Rebecca Goodine, Jeff Mundee and Nathan Thompson is a game inspired by the events of Cecil the lion. Messtiny: Vault of Crass is a Destiny de-make by Don Levandier, complete with real-time action combat. Hot and Heaven by Suzanne Lapointe is a funny game set in the afterlife. Just Cross by Josh Robertson is the longest submission, clocking in at about an hour and a half. It’s a mini RPG where you play as a chicken attempting to cross The Road. Washed Up is an island survival game by Kyle Honey. Kalar’s Proud Ghost by AshenStar is the only entry from a person I don’t know in real life. He found out about the game jam via itch.io and submitted his game, a short adventure about a ghost in need of help. Overlord by Tyler Matchett, a strategy game that was totally made in RPG Maker, hehe. 50 is a short introspective game made by yours truly. I've played through all the games, and I'm really impressed by the variety and quality. Great job everyone! I was glad to see people make their first game during the jam. One couple even made another game since then! I think that the short duration and immediate goals of a game jam could give some people that extra push they need to actually start making games. In the end, the game jam was a lot of fun. Participants have told me they had a great time making and sharing their games. Thanks to everyone who took part in the jam, it was a blast! I’ll definitely be organizing more jams in the future. Prizes: In what I thought was a long shot, I contacted RPG Maker to ask if they could provide prizes. Shortly thereafter, I was pleasantly surprised to read that they would offer credit for their web store as prizes. Since they were having trouble getting the store credit, RPG Maker supplied me with three codes for the new software RPG Maker MV! The winning entries, voted for by participants, were Just Cross, Pride, and The Fall of Grant Manor. Thanks to RPG Maker support for the download codes!